the parents’ progress. | everything will turn out alright. we have made a lot of headway on sylvie’s nursery in the last few days! tonight we got her bookcases put to together! and a close-up of all of her cute things! the larger of the two lambs was mine when i was a wee babe. it plays mary had a little lamb and moves its head from side to side when wound. the picture in the frame is a photograph of my nana and sylvie’s namesake. the zebra and the hippo come from my parents and trav’s parents, respectively. that little panda next to the zebra is a paci plushie from allie at it’s a wonderful life. the rest are things we purchased for her at various places. 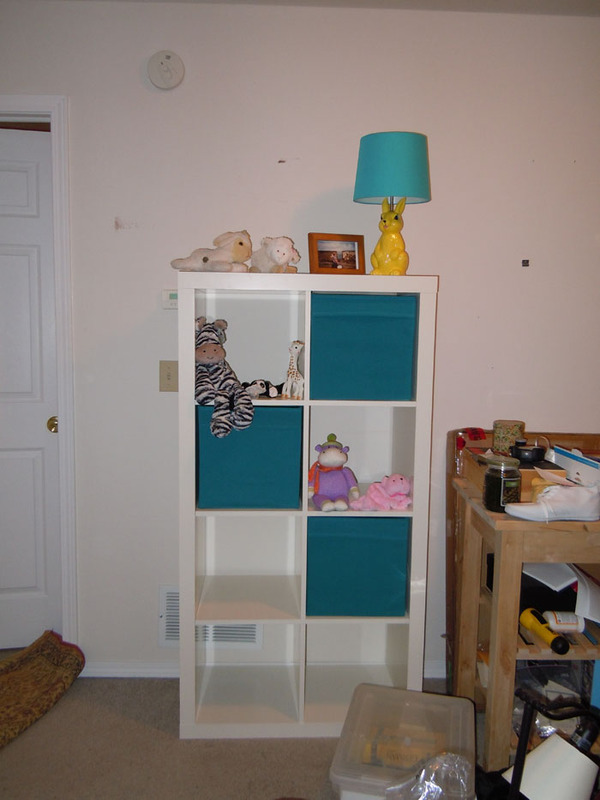 here is the smaller of the two bookcases. these red bins are fantastic! they are really heavy duty canvas and zip completely closed. they’ll be great for when she’s mobile and constantly trying to get into things! 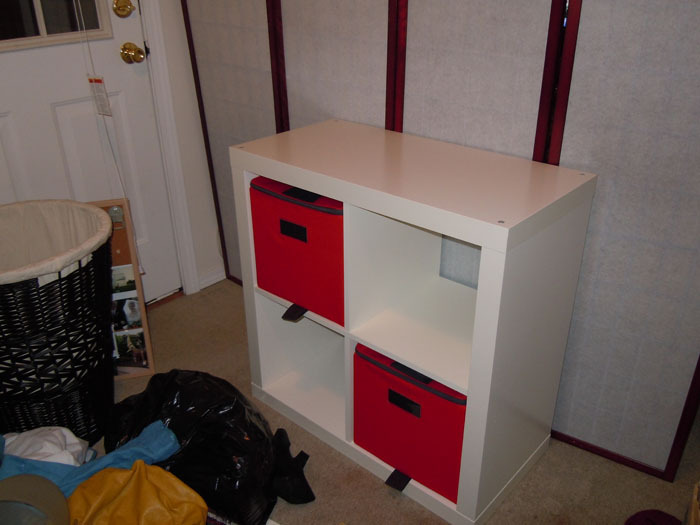 both bookcases are part of the expedit series from ikea. the bins are from ikea, too. as you can tell from these pictures, there is still A LOT to be done! still, i think we’ve made great progress this week. we’re going to be parents in 3 months. she could be here, completely healthy, in 11 weeks. how crazy is that?! i can’t wait to meet her! 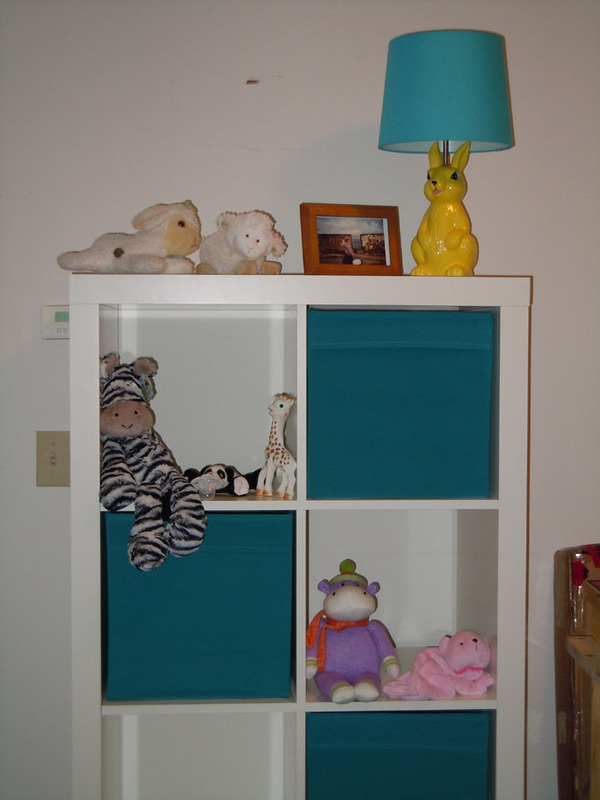 This entry was posted in Uncategorized and tagged bookcase, cute, ikea, nursery. Bookmark the permalink. You were so right about the bunny lamp- its ADORABLE. That’s fantastic! It’s all coming together. We can’t wait to see and hold her. August can’t come soon enough! Bunny lamp=pure win! SO CUTE.